So you are ready to take a big step in your life and buy an engagement ring? It can be a daunting process. The ring is a symbol of your love and commitment to each other. Of course you want it to be perfect! With Ellissi’s wealth of experience in designing and hand crafting the most beautiful engagement rings, our jewellers can help ensure that the ring you purchase is just right! In the following pages, you will see some of the very best engagement rings Melbourne has to offer. Our site features hundreds of exquisite custom made rings. These are some of the many ring designs our jewellers have crafted over the years here in our studio workshop in Melbourne. What follows is a portfolio of our stunning work, carried out on behalf of our clients. 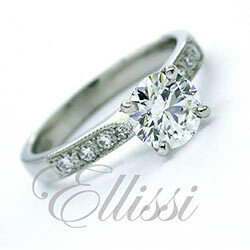 As you will see, the Ellissi website is no ordinary site, and we are no ordinary jewellers. Superb handmade rings at workshop prices: that’s extraordinary! With our personal service and custom designs, we make buying an engagement ring easy. We offer a lifetime guarantee on the workmanship our our rings. So you know that you can buy with confidence from one of Melbourne’s most trusted jewellers. If you are at the beginning of your journey and are looking for ideas, our step by step guide to choosing a design will help you to find your perfect engagement ring! Please don’t hesitate to contact us if you would like to ask a question about any of the styles you see on our site. Of course, as we are custom designers, you can ask us about other designs too. We are more than happy to advise on what is possible. You will find the experience of dealing directly with the jeweller who is making your engagement ring greatly beneficial: the right diamond, the design you want, great service, a quality ring and lifetime guarantee on workmanship. And all this at workshop prices! At Ellissi, we take great pride in showing you just a few hundred of the many beautiful rings we have created over the years. We hope you enjoy looking at them as much as we have enjoyed making them. Designing and buying a ring from Ellissi was an absolutely pleasure. Ian and Jess were extremely knowledgeable, helpful and friendly. We went in knowing very little about diamonds and engagement rings. The time the Ellissi team took to help us understand what we were buying and how to create a beautiful ring that would last (and at a cost within our budget) was invaluable. Could not recommend them more highly!! Great design, service and craftsmanship. I do not trust another jeweller. Have been going here for 12 years. I had a fantastic experience with Ian and Jess and I highly recommend Ellissi Jewelry. Ian provided an exceptional quality of service. He was very patient in explaining the aspects of diamonds and assisted me with recommendations to find something in my budget. He was also very experienced when it came to the detailed design asthetics of the engagement ring and helped shape a design I had mind. Jess was also very helpful with fielding many questions on options I had and providing updates on the progress of making the ring, and how to care for it after purchase. Ian from Ellissi Jewellery made our wedding rings and we are so happy with them. Ian really knows his stuff and his craftmanship is just stellar. Thank you Ian and Jess for a wonderful experience and making such a beautiful set of rings. Two thumbs up! I can't thank Ian enough for the amazing ring he helped my fiance and myself create! He took the time to educate us on everything we needed to know and I felt completely comfortable with him. I would recommend anyone looking to get a beautifully handcrafted piece of jewelry to contact Ellissi.